I have a JP 3ds, so I should have that stationery. I could send it to a few of you if you want. I just have to send you a message using it, right? I'm really not sure if that's how it works. Worth a shot though. Edit: Actually, I guess I'm wrong according to the article. I don't know what the stationery looks like actually. I think I've added everyone who added me-- I miss anyone? Hmm...Swapnote just informed me that I got new stationary. Is it the one EVOL sent? Yeah that should be the JP exclusive one. I sent it to the people who added me back at the time, and I'm pretty sure Invisible Ink spread it to others. Been MIA since Christmas, but will stat adding people from the OP. I'll PM people I add, but if you added me and I didn't add back yet, shoot me a PM. And how do I get in on some SNRPG? That's so cool. You and someone else here need to become player and DM. The DM person creates a dungeon using the template image I whipped up. Then follow the instructions in my video. It requires a little front end work by the DM, but is totally worth it. I would really like others to give it a try so I can get feedback. As always, I'll answer any questions you might have as well. Alright, I've been added to the "List", I'm going to start adding people also on it. If anyone adds me and I missed you, PM me and I'll fix that. Thanks for the new stationery, InvisibleInk! I have now sent it along to my non-PA friends to continue the virus. Alright, I started at 9:10am Central time, it's now 10:00am. I added everyone in the list. If you were added to the list between those times, I didn't add you. Alright everyone, please add me back if you haven't already ^^ If it helps, I'm one of those people expecting to get Animal Crossing as soon as it comes out and would love visitors. It's irritating I can't add people from the Internet if I'm not connected. Why can't I add them in now and then it checks for verification when I get to an internet source? 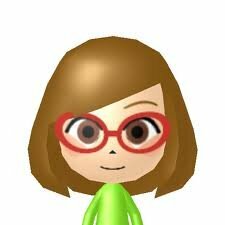 But I got the Nikki Mii and posted my friend code so hopefully I'll get some stationary. Hopefully everyone here is planning on getting Animal Crossing. I have more of a chance of putting more time into it on here than I ever did on the Wii. Portable Animal Crossing is the best Animal Crossing. Ok, I added everyone (I think) that mentioned me in the thread and some that didnt! Thanks. Expect some (poorly drawn) doodles soon! Sporky that bird reply to my naked lady peephole had me giggling for 6 minutes. 6 MINUTES!! Nikki thanks me for playing and is showing the staff credits! I have 302 notes, 237 replies, and thus a total of 539. I imagine it happens at 300 notes. Also man I gotta add people here, blah. So... even though there's no indication that my messages are being sent, you guys are receiving them, right? Just sent one asking for Game of the Year doodles. Let me know, because it makes me uneasy that there's no "Message Sent" and that everything you write is "saved for delivery," even if it actually sends out right away. Yeah, I got that one. I sent an Arkham City drawing back to you. Did you get that? I gots 263 notes and 133 replies, 396 total. C'mon people I need more notes haha!! Then add me back I added 50 people, and I'm waiting for 39 to add me back. Add me, guys! I added you EVOL, could I get that snazzy JP stationary? Everybody not on the first page...ugh, gonna have to delete some older friend requests first. I had added about 75 people from the 3DS code site, and then deleted about 50 of them that never added me back. So yeah, I know that feeling. You guys keep sending out some amazing stuff though. I'm constantly amazed by what you guys draw. I want to send out something awesome, and then it looks terrible so I end up deleting it. You guys keep sending out some amazing stuff though. I'm constantly amazed by what you guys draw. I want to send out something awesome, and then it looks terrible so I end up deleting it. I know excactly what you mean, and I'm pretty much the same way. It's just so hard for me with such a small space. Yeah, that's my excuse. Added and sent. Feel free to ask me if anybody else doesn't have the stationery. Added everyone in the OP list, most of which I had so it kept telling me friend added, but since names are different from the forum handles (in most cases) it makes it hard to know who've you added already. If I added you and you hadn't already added me, I sent a PM to you. Yup, I added everyone that either A) yelled at me, B) sent me a PM, or C) used that list that sends me an email when someone adds me. Alright, I added everyone in the OP. Whew! Please except my request if you haven't done so already. Also, did I miss anyone? Edit: And my video just hit Joystiq! Sweet! @MNC Dover noticed that your SNRPG was on Joystiq earlier today. Edit: NM looks like you already knew. Nikki's official Mii has been released, you can add her to your Mii list. Is it the Japanese Nikki? I have that one. I'd love for one with an English name to release though. I added a bunch of people from the OP. Not all of them... I'm sick and it's hard to focus on one task too long. So add me and if it doesn't go through then just shoot me a PM or leave it in this thread. add me, motherfuckers. sporky and xeno i'm looking at you especially. so is bill murray. ps sent out the best stationery ever! I don't understand how we get that? The only QR thing I know of is in Pushmo? 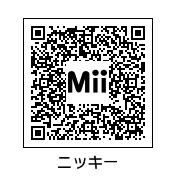 Go to the Mii channel, and there's an option at the bottom for QR codes. Go to Mii Maker and there should be an option to scan QR codes.